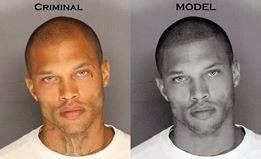 Mugshot of Jeremy Meeks as a criminal and as he would be like a model. Leave a comment to judge. Drug dealing, gun running, gang banging criminal.